Owl Always Love You Valentine’s Day Craft for Kids – Another fantastic craft idea for kids from Oakland County Crafters. Perfect for teachers for Valentine’s Day fun or for parents to implement on cold, snowy February days! When it comes to Valentine’s Day we think of love, pink, red, hearts… Why not owls? As a former preschool teacher, this was one of my favorite crafts I did every year with my kiddos and they enjoyed it too! Get in the crafting spirit and enjoy some quality Valentine’s Day time with your children by making your own “Owl Always Love You” craft. Here’s to make a great craft for kids to design their own Valentines! Cut the three separate circles for your owl eyes. I use a drinking glass to trace circles onto the construction paper before cutting. The top of the glass for the largest circle and the bottom of the class for the second smallest. Cut out a small rounded beak out of orange colored construction paper. Paint both hands with paint that matches the Valentine color of your owl body. Use a separate sheet of paper to print your hands on. Allow your handprints to dry before cutting them out in a wing format. Glue your owl pieces and wings on to your owl body. Add your sticker foam hearts to the belly of your owl. And that’s it! The biggest thing to remember when it comes to crafting, especially with little ones, is that imperfection and messy is best. Your owl shapes don’t have to be perfect. 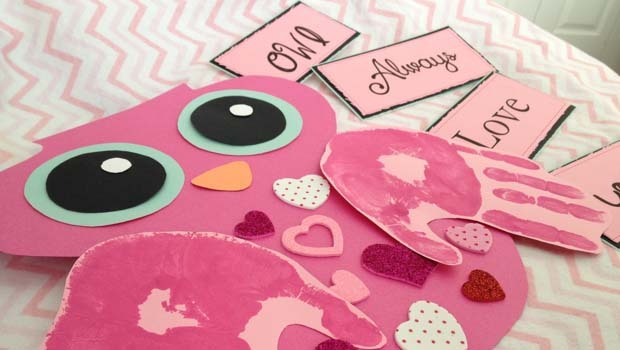 Simply have fun, get messy, and enjoy celebrating Valentine’s Day together by making your own “Owl Always Love You” Valentine’s Day Craft! Enjoy & Happy Crafting! Owl Always Love You Valentine’s Day Crafts for Kids article submitted to Oakland County Moms by Samantha Bronsing of Oakland County Crafters.